Presented in a fun and creative way, team building exercises challenge your group to step out of their comfort zones and force them to work together. As a business owner, manager, coach, or scout leader, you are always looking for ways to improve your group. For businesses, they are constantly looking for ways to increase collaboration, productivity, and, most importantly, profits. For coaches, it’s all about teamwork. And for scout leaders, they are interested in experiential learning – life lessons and skills taught through shared experiences. These are three very distinct and seemingly very different goals. However, each can be accomplished in a very similar manner: Team Building. And it takes just a single afternoon. That’s what we like to call a win-win. Presented in a fun and creative way, team building exercises, like the Labyrinth (below), challenge your group to step out of their comfort zones and force them to work together to solve certain tasks. These simple exercises help break down communication barriers and foster better collaboration, which will, in turn, help drive productivity, promote teamwork, and teach valuable life lessons. After each exercise, the participants and their facilitator discuss the lessons behind what they just did. This discussion is designed to reinforce these lessons and help ensure that the progress made during one afternoon of team building is not lost after a few days’ time. You probably remember that game that came in your cereal box when you were a kid where you had to get a tiny metal ball through a maze without dropping it into a hole — this is the same game, only it requires a few more people and a different kind of ball. Lessons Learned: The goal is simple. Get the ball through the Labyrinth without falling through the holes. The challenge: members of your team surround the Labyrinth and must work together to move the structure in unison and get the ball to its destination. The Labyrinth is great for teaching good communication skills, fostering collaboration and teamwork, and showing how one small movement can change the whole game. How will your team handle this challenge? Will they work together or will they struggle to cooperate? Who will take on leadership roles? The Labyrinth is just one example of the many different team building exercises that Terrapin Adventures uses to help your team reach their full potential. Terrapin Adventures is conveniently located in Howard County, Maryland, between Baltimore and Washington DC. Our experienced staff is able to create a customized program that exceeds your requirements to help increase communication and productivity of your group. 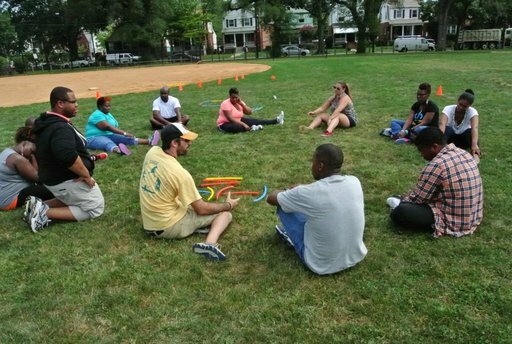 We offer both onsite and offsite team building solutions, as well as indoor and outdoor options. This entry was posted on Monday, May 18th, 2015 at 3:35 pm. Both comments and pings are currently closed.